We were told "Big Red" raised 6 orphaned Great Horned Owlets this year. This marked our 3rd year of visiting "The Owl Foundation". Not open to the public, they have two weekends in the Fall when sponsors are invited to come to the property for a tour. It may be the same place, but it's always a different tour, learning new things about what's going on at the foundation. 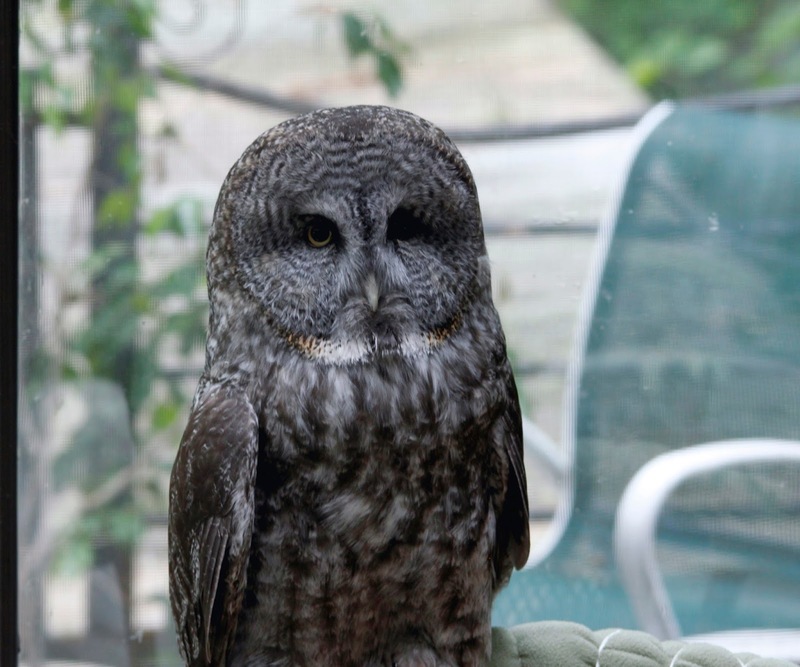 The Owl Foundation is home to resident owls who have injuries that make it impossible for them to be released back to the wild, but kept wild at the foundation, they make perfect "foster parents" to young orphaned owls of the same species, who eventually are released. This is just part of the amazing work done here. Check out their website to learn more about the organization that studies, rehabilitates and releases owls. 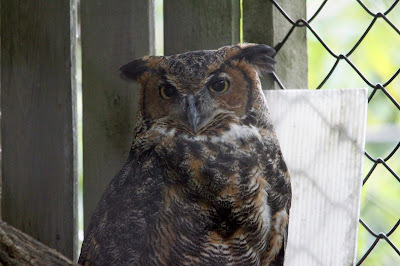 It's become a bit of a tradition for Rob and I to sponsor a young releasable Owl for friends, as a birthday gift, or last year, to celebrate the marriage of Murray & Debbie. This year we were once again joined by our friends, Jim and Lynda. Lynda is celebrating a "milestone" birthday next month and was thrilled with her sponsorship gift package. Our tour started in the house again this year, and as the last couple times, I'm thrilled when I get to see and speak to Kay McKeever, the lady who started it all more then 30 years ago. She's been working with owls since before I was born, and I can't even put into words how much I admire this woman. She is almost 89 years old, but her quick wit was quite apparent during our visit. Kay McKeever, so much wisdom lies behind these eyes. 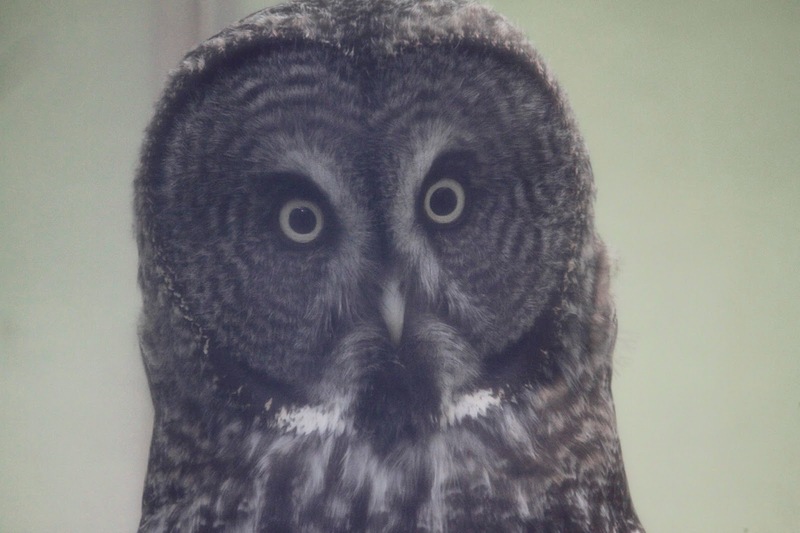 "Big Bird", a resident Great Grey, who lives in the house with Kay, and who she calls, "the love of her life". 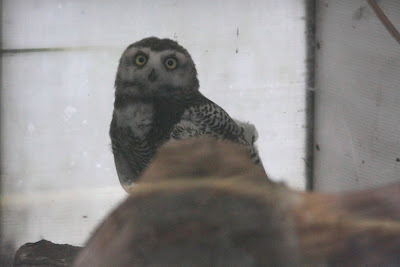 Again this year we learned many interesting stories about the resident owls who are allowed to choose their own mates and raise chicks to be released. We were happy to hear that "Sassy Q" and "Yeti", 2 resident Snowy Owls, had a successful clutch again this year! Last year was the first time for the newly bonded pair, and they had 3 chicks, this year they had 5! The enclosures the owls are in are large and well designed, often covered with protective netting from mosquitoes. 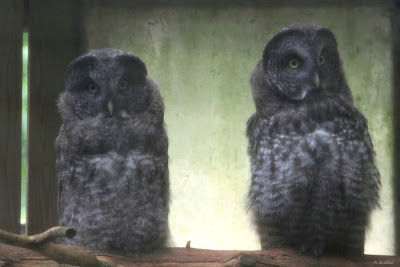 The northern owls are very susceptible to west nile virus. This measure of protection is great for the owls, not so good for taking pictures, but Rob does the best he can. One of the 5 young Snowy Owls hatched this year. Not used to the presence of humans, the young snowies were a little skittish so we didn't linger long in front of their enclosure. Two young Great Greys hatched in residence that will be released when ready. It was another educational and inspiring visit, and I invite you all to learn more about this amazing organization. To read about our first visit in 2011, click here. To read about our second visit in 2012, click here.